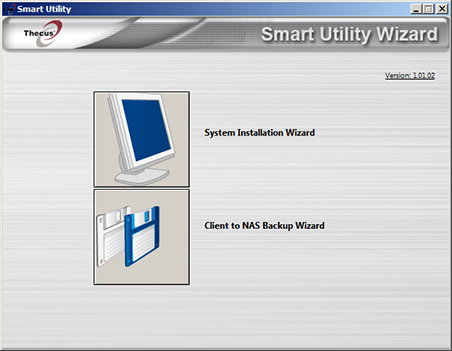 What is the first thing that springs to mind when you consider the NAS (Network Attached Storage) abbreviation? Is it something bulky and very heavy, difficult to configure and use? Today in our testing lab we have a network storage that can totally destroy the stereotype. 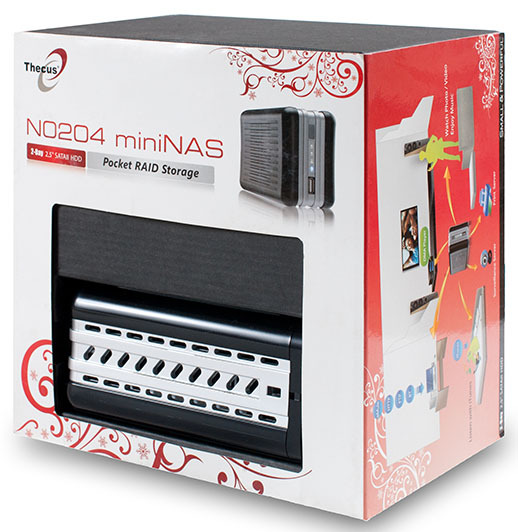 Thecus N0204 is so small and light that it fits into a pocket without weighing it down. At the first glance it may even seem that it’s not a fully-functional storage but just an ordinary external hard drive. However, this is not so at all. Let’s look at it in more detail. 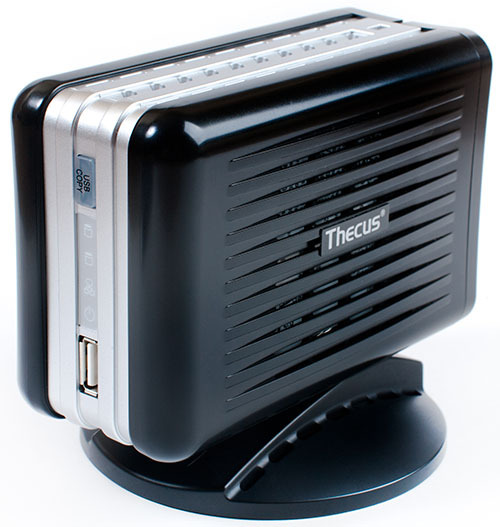 Thecus N020 is performed in a small black plastic case with a wide silver inset in the middle. The dimensions of the device are 88*63*133 mm. 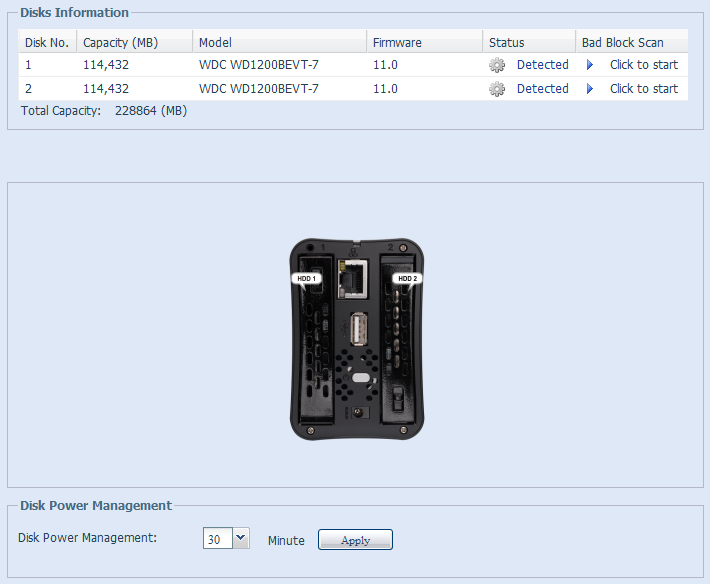 It was possible to achieve such a small size by using 2.5” hard drives, which isn’t typical for network storages. 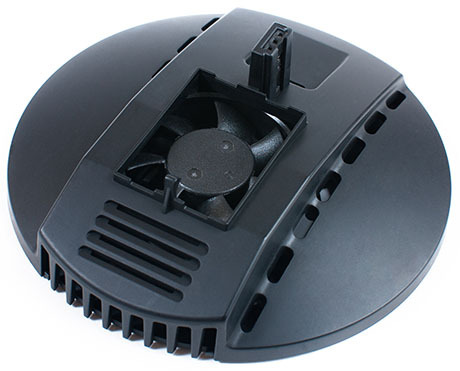 To enhance cooling there’s a round plastic stand with an embedded cooler creating an additional vertical air flow. The side panels of the N0204 are ventilating grates for heat removal from the hard drives placed vertically behind them. Also, here is the vendor’s logo. 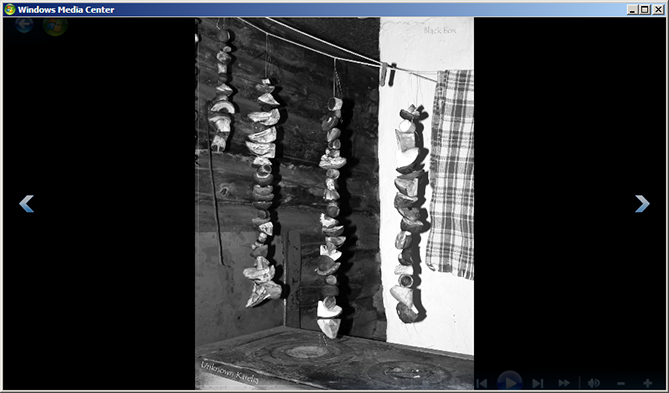 For the purpose of better ventilation there’re also technical holes on the top and on the bottom of the storage. Also, on the bottom there’re pins providing cooler rotation in the stand when you use it and four tiny rubber stands allowing putting N0204 right on the table. The stand itself is a convex disc 102 mm in diameter with a thicker central part in which a 40 mm cooler is placed. We have to confess that we were baffled by the cooling system: instead of pumping cold air upward into the device, the cooler on the contrary pumps it out preventing natural convection. 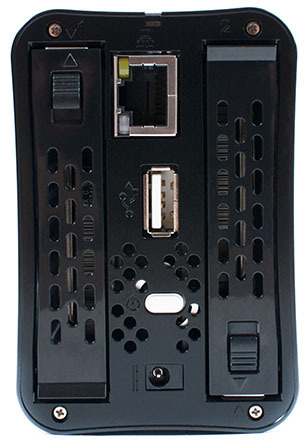 The front side of N0204 displays four light indicators showing the state of the device itself, the network connection and the hard drives; a USB COPY button for making a backup copy of data from a drive connected to the USB 2.0 port located on the front panel. On the rear panel there’s a network connector, a USB 1.1 port, a power slot and an on/off button as well as two slots for 2.5’’ hard drives. We were surprised to see a USB 1.1 port here as USB 3.0 has long been making its way into the market. 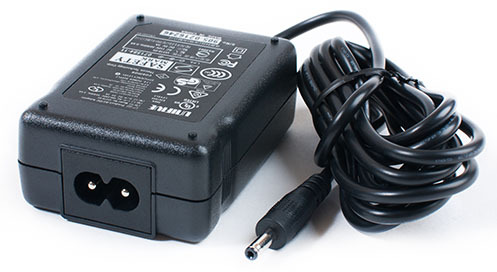 For its operation Thecus N0204 requires 3A DC at 5V voltage, for which it uses an external power adapter with an RF-180 slot with the maximum drawn current of 0.4 A, i.e. designed for 88 W of power. The plug inserted into N0204 didn’t seem to be well fixed: it was loose and the impression was that it couldn’t be normally plugged. 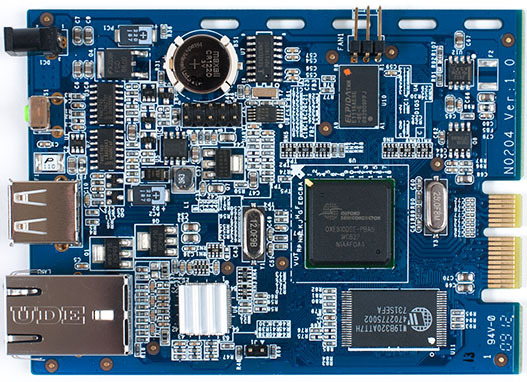 Thecus N0204 electronics is represented by two dark-blue textolite boards the smaller of which is used exclusively as an adaptor between the main board and the hard drives. On it, there’re also the LEDs of the front panel, the USB-port and the USB COPY button. 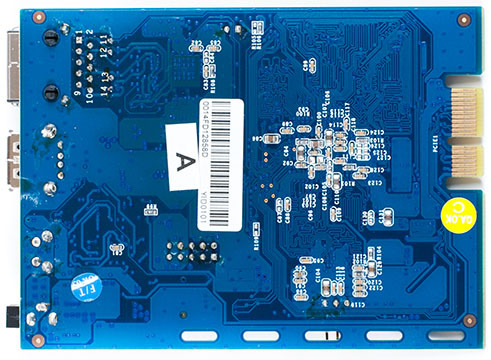 The intellectual components are put on one side of the main board. 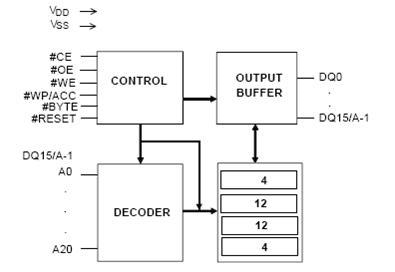 Oxford Semiconductor OXE810DSE-PBAG with an embedded ARM926EJ-S ARM-processor working at 367 MHz is the storage controller. Below is the diagram of it. A Winbond W19B320ATT7H 4 Mbyte chip is used as flash-memory. See the diagram below. RAM is represented by a DDR2 Elpida E1116AESE 128 Mbyte chip. An LSI ET1011C2-C chip hidden under the additional radiator is responsible for the physics of the Gigabit Ethernet. 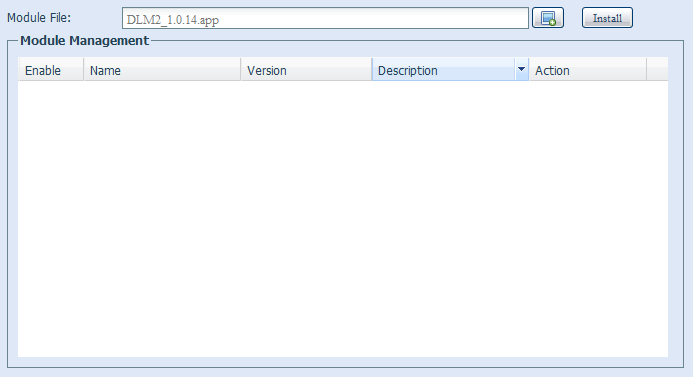 Now let’s have a look at the software component. An “out-of-the-box” Thecus N0204 isn’t ready to work. 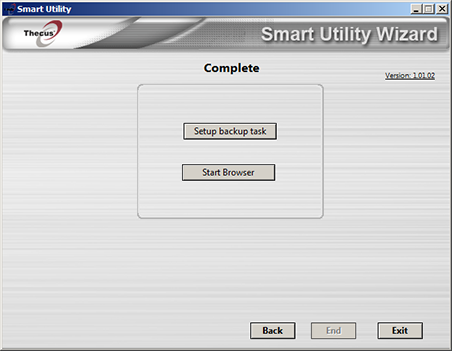 First you have to download and install the latest firmware version into it, for which it’s necessary to use Thecus Smart Utility also available on the vendor’s website. 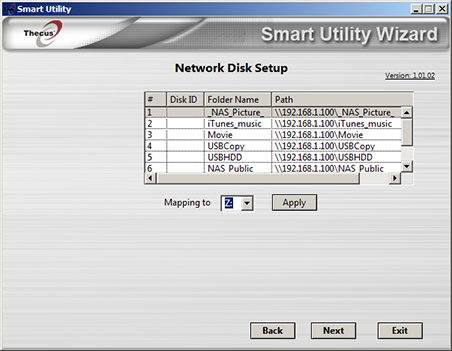 After the start the utility searches for Thecus network storages in the local net and if it detects any, it displays information about them. For the chosen storage you’re offered either to prepare it for work or to configure a task for computer data backup. The N0204 system installation can be performed fully automatically or with manual parameters’ selection. Naturally, we chose the second option which, it has to be said, doesn’t take much longer than the first – you only have to select the RAID type and connect a network disc if necessary. After finishing initial configuration N0204 is ready for work, you can start the browser and configure the device further if necessary. We’d like to note that you’ll have to perform the actions described in this chapter every time you need to change RAID, as part of the system data is kept on the user discs. When we received the device it had the latest firmware version 3.00.12, so to describe the process of firmware upgrade we turned to the available beta-version 3.00.12.3 at our own risk. The vendor only allows updating firmware, i.e. it is impossible to undo the update to the previous version. The version change is performed via the web-interface with the help of the Software Upgrade item of the System Management menu where you have to choose the file with the new firmware and click Apply. After the file has been uploaded to the storage, N0204 will ask for the upgrade confirmation. 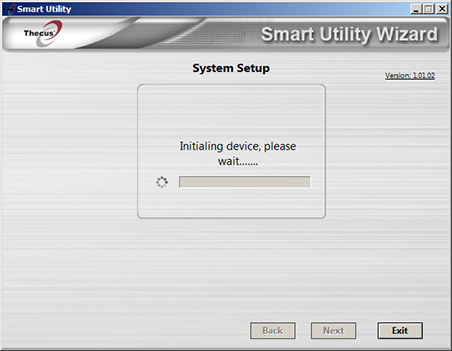 If the answer is affirmative the system update will be done automatically and will take about three minutes, after which the device must be rebooted. 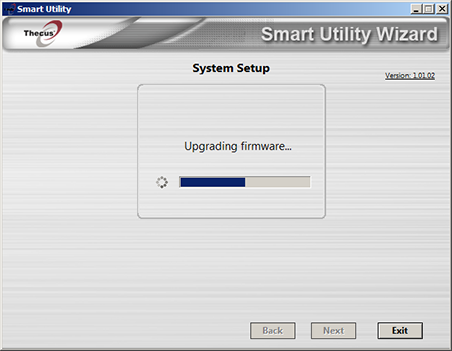 The whole firmware upgrade process takes about five minutes. Beside standard functions N0204 firmware offers, the user can get additional options by installing expansion modules. 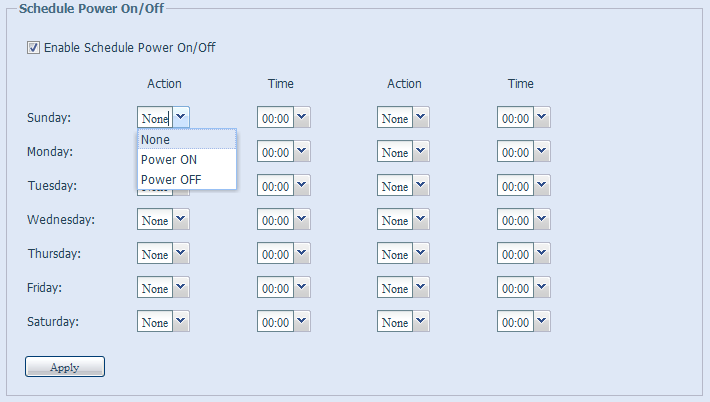 Module management is performed with the help of the Module Management menu. 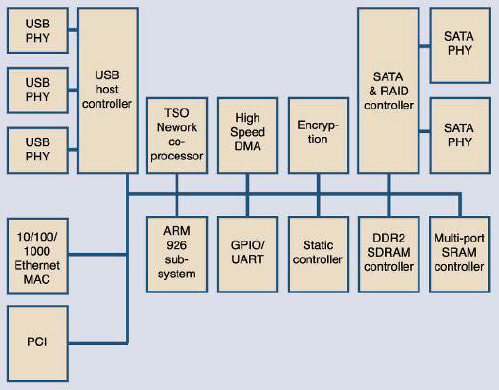 Module packages can be installed either manually (Modules item) or automatically (Auto Module Installation item) provided there’s internet access. First we decided to install several modules automatically and after that to add the missing ones manually. 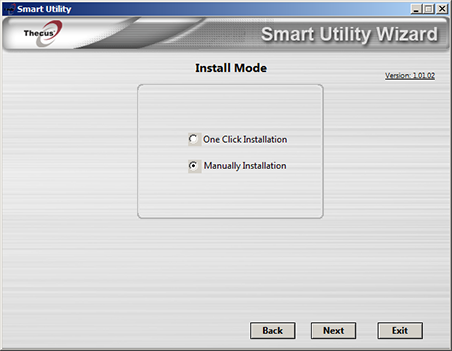 In automatic installation the chosen module is downloaded from the vendor’s site by itself. Manual installation isn’t much more complex: you just have to download the module of interest from the vendor’s site, extract it from the archive and upload it to the storage. No matter how the module was installed, before using it you have to enable it in the Modules item of the Module Management group. The modules’ functions can be quite diverse: from scheduled USB-drive backup and different download wizards to a surveillance system (with the help of remote IP-cameras as well as local ones connected via USB) and a multimedia server. Expansion modules can be written either by the Thecus Company itself or by third party developers. Examples of third party works are DROPBEAR and ROOTCMD about which we’ll talk in the next section. Installation and enabling DROPBEAR and ROOTCMD modules don’t give the user access to the command line straightaway, because first root user’s password has to be changed. The password change is performed utilizing the ROOCMD module and the command below where instead of “new password” the new password for root must be specified. Command line access is given via the SSH protocol. We used PuTTY 0.6 as an SSH-client. Busybox is traditionally used for such type of devices. We decided to obtain the list of processes run on the storage. 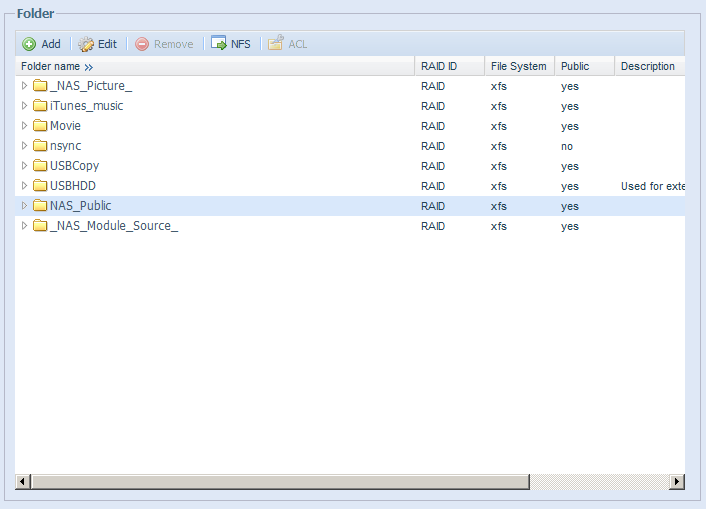 Also, we wanted to see the contents of the /bin, /sbin, /usr/bin, /usr/sbin and /proc catalogues. 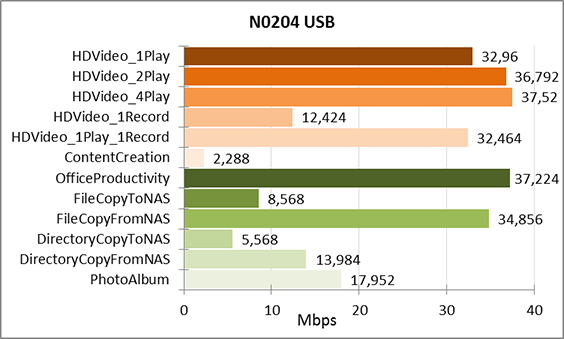 The load of N0204 can be estimated with the help of the /proc/uptime and /proc/loadavg files. 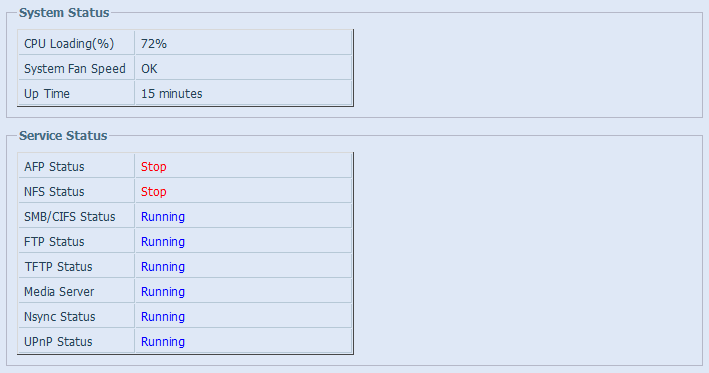 In the cat uptime output there’re two numbers showing the storage’s uptime and idle time, respectively. The first three numbers in the cat loadavg output show the average load of the device within last 1, 5 and 15 minutes, respectively. As we see, at the moment N0204 isn’t loaded at all. From the /proc/cpuinfo file we’ll get information about the platform used. The /proc/filesystems file contains a list of the supported file systems. 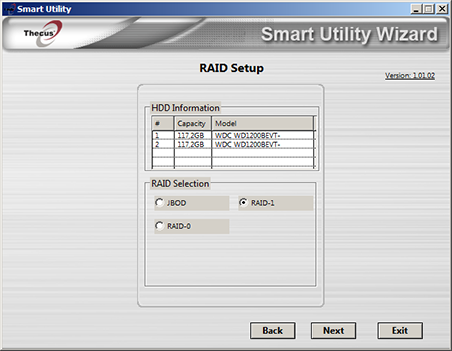 The /raid catalogue has a data link leading to a catalogue where RAID data are mounted. 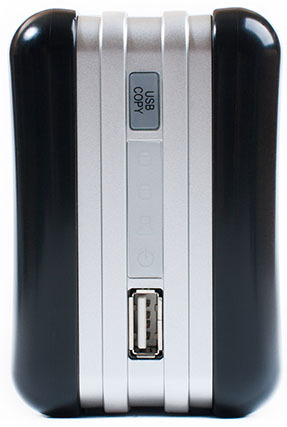 In our case the external hard drive was mounted to the /raid0/data/USBHDD/usb3/1 directory. The device can be turned off with the poweroff command in the command line. 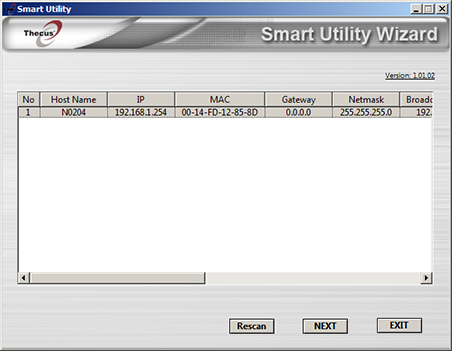 Now let’s look at the features of the Thecus N0204 web-interface. After entering the N0204 address into the browser’s address bar the user gets to the storage homepage from where he can either configure the device or get access to files or start browsing photos. 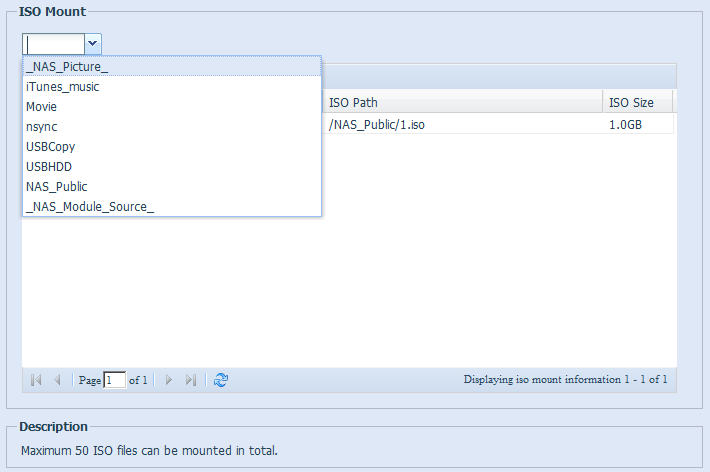 Let’s start with configuring N0204. 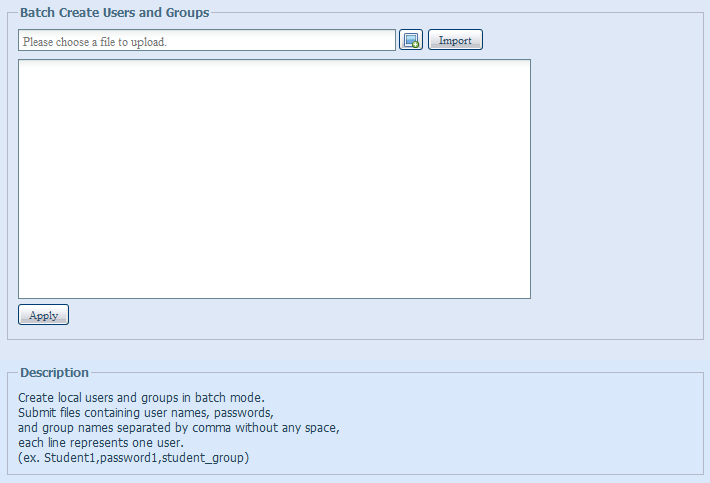 First the administrator’s password is requested which is admin. 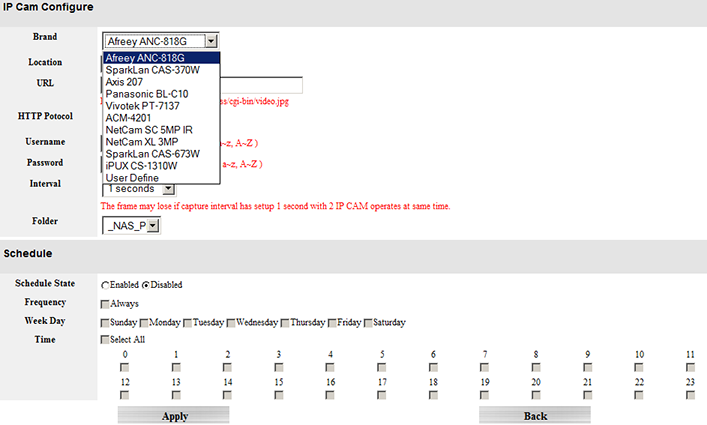 After entering valid account data the user finds himself on the page with selected functions. The main menu is to the left and contains the following items: System Information, System Management, System Network, Storage, User and Group Authentication, Application Server, Module Management and Backup. We’re not going to consider all the features of the storage, but will stop at those that are the most interesting in our view. Brief information about the storage platform, uptime, the CPU load and the running services can be found in the Info and Status items of the System Information menu. Now let’s move to the System Management group where the user can set the time synchronization parameters, configure notifications via SMTP, control the device immediate or scheduled turning on, rebooting and shutting down, upgrade the firmware, check the file system as well as manage the current storage configuration. We’d like to note that Thecus N0204 doesn’t support Cyrillic domains, so it won’t be possible to synchronize time with a server, for instance, время.провайдер.рф – the user will get a notification about an incorrect NTP server format. Perhaps, time synchronization and scheduled work will be in most demand if N0204 is used as an office storage, though in this case it’s worth choosing less compact models. 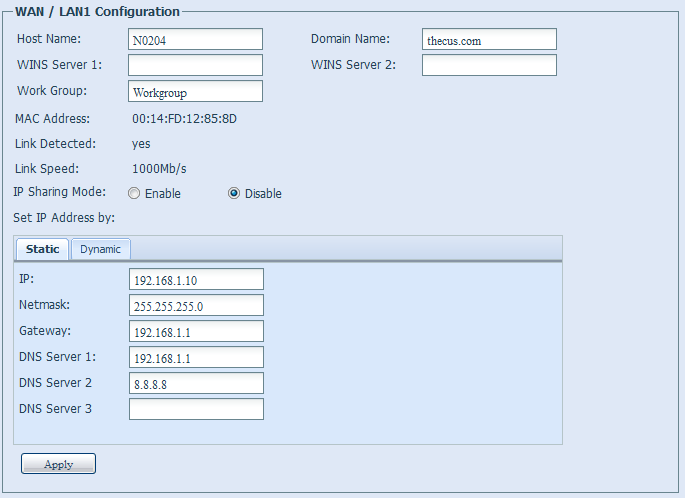 The System Network group allows specifying IP-parameters of the only wired network interface in the WAN/LAN1 Configuration item and to configure each service separately. The configurable services are Samba/CIFS, AFP, NFS, FTP, Media Server, HTTP/Web disk, UPnP, Nsync, Bonjour and TFTP. The TFTP support though not very complicated isn’t very widespread and N0204 is a pleasant exception. In our view, another handy option is the ability to limit the bandwidth of downloading and uploading data via the FTP protocol. 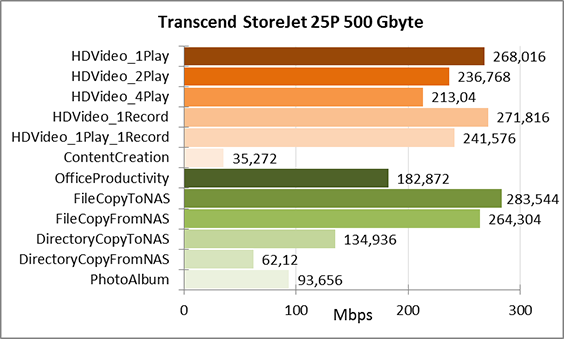 The limitation is performed with a 1 Mbyte/s step with the maximum rate 32 Mbyte/s. Jumping ahead of ourselves we’d like to note that the scale of limiting the FTP data transfer speed is overdesigned as while testing we failed to achieve such high speeds. Additional Nsync copying management is performed with the help of the only item Nsync Server of the Backup group. Now let’s turn to the Storage group where the user can manage folders, discs and the RAID as well as mount ISO disc images. Altogether it’s possible to mount 50 images. 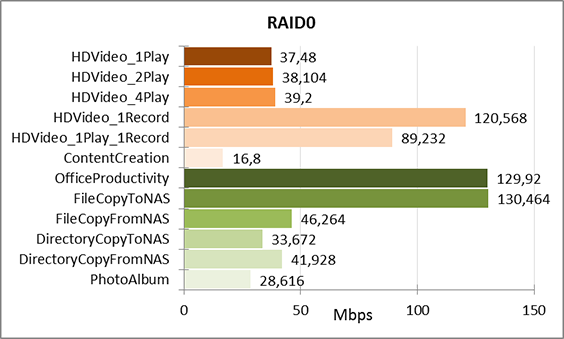 Thecus N0204 supports three RAID types: JBOD, RAID0 and RAID1. User and group management is performed with the help of the User and Group Authentication group items, where manual configuration of one user is possible as well as batch configuration of a number of accounts. 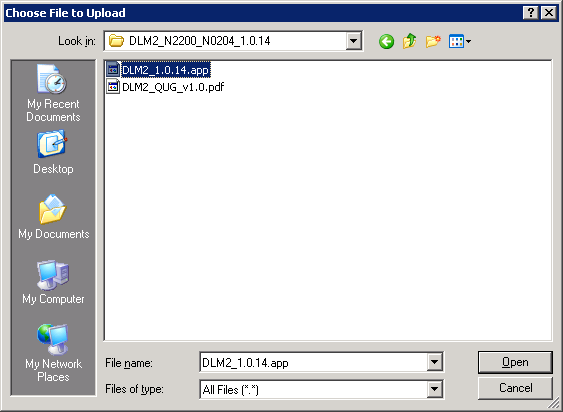 The Application Server group contains two items Printer and iTunes allowing managing same-named tasks. Installation, launching, configuration, termination and deletion of additional expansion modules is done with the help of the menu item in the Module Management group, but this topic has already been covered above. Here we finish the brief review of the features of the Thecus N0204 web-interface and move to testing straightaway. Traditionally we start the testing section with determining the booting time of the device. By booting time we mean the time interval from pushing the power on button to the arrival of the first echoing back via the ICMP protocol. Thecus N0204 boots in 42 seconds. We think it to be a normal result. The second test was to check the storage security, for which we used a network security scanner Positive Technologies XSpider 7.7 (Demo build 3100). Altogether we found fourteen open ports: TCP-80 (HTTP), UDP-137 (NetBIOS Name), TCP-139 (NetBIOS Samba), TCP-443 (HTTP SSL), TCP-445 (Microsoft DS), TCP-631 (HTTP), TCP-1194, TCP-2000 (FTP), TCP-4662, TCP-4711 (HTTP), TCP-4712, TCP-9000 (HTTP), TCP-9091 (HTTP), TCP-51413. Maybe, the found open ports wouldn’t pose any hazard but for a very serious insecurity we discovered in PHP servicing HTTP on the TCP-80 and TCP-443 ports. As we consider the discovered insecurity serious enough we reported it to the vendor; we hope that in further firmware versions this problem will be solved. Also we uploaded our audio- and video-records and photos to N0204 and then successfully detected the storage in the network. After connecting to it with the Windows Media Center and the Windows Media player we were able to watch and listen to our multimedia data. 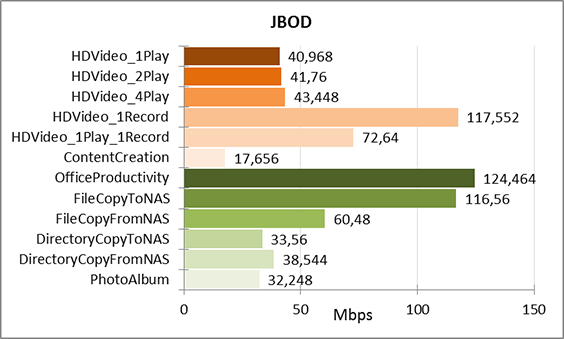 Perhaps, the storage performance tests will be the most interesting, so we’re moving to them. 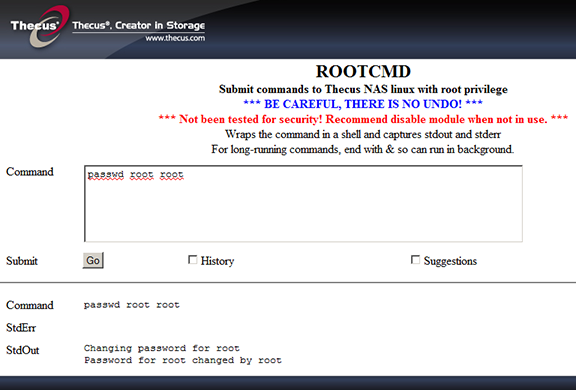 Thecus N0204 supports three RAID types (JBOD, RAID0 and RAID1) which it allows formatting for the only file system – XFS. We held our tests with the help of the Intel NASPT 1.7.1 utility. In accordance with the vendor’s recommendations we intentionally reduced the available RAM on the test stand to 2 GBytes to prevent caching the program queries. The main PC parameters are presented below. 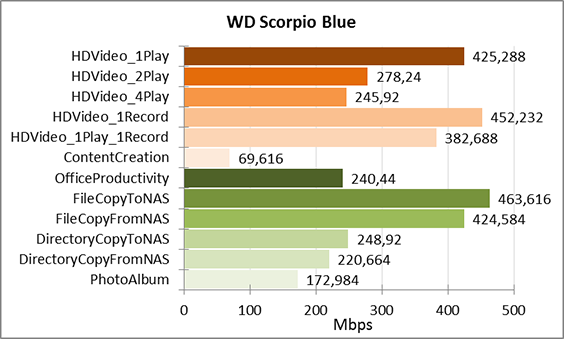 For our tests we used 2.5’’ hard drives WD Scorpio Blue whose speed parameters are presented in the table and the diagram below. For each of the three available RAIDs we made measurements the results of which we drew to a single table and diagrams. 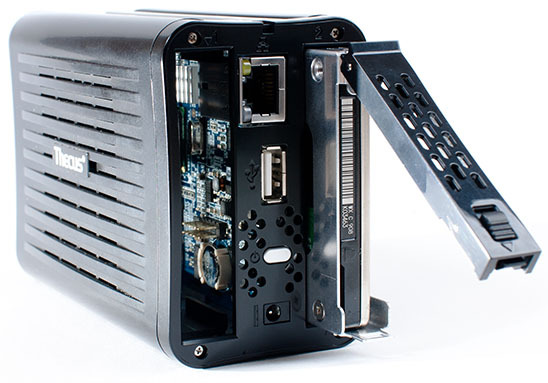 As the N0204 front panel has a USB 2.0 port that allows connecting external USB-discs, we couldn’t leave this option untested, so we used a Transcend StoreJet 25P 500 Gbyte disc. First we measured the disc speeds when it’s directly connected to a PC and then – to the storage. 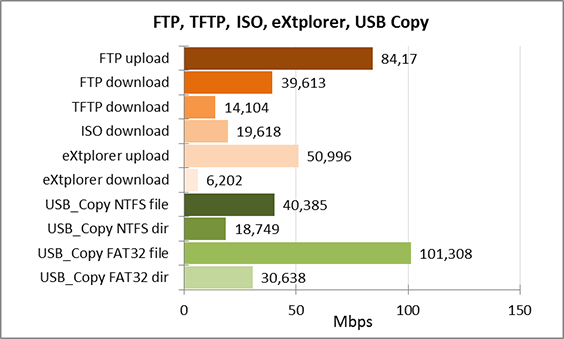 As Thecus N0204 allows data transfer via FTP and TFTP, we held these tests as well. Unfortunately, we failed to transfer files via TFTP because of some error related to access rights, that’s why for TFTP we only have the downloading speed. Such one-way transfer may be in demand, for example, for transferring new IOS versions to the Cisco Company equipment. Also the storage support of compact discs ISO-images wasn’t left aside. We created an image with big files, connected it to N0204 and measured the transfer rate to the test PC. 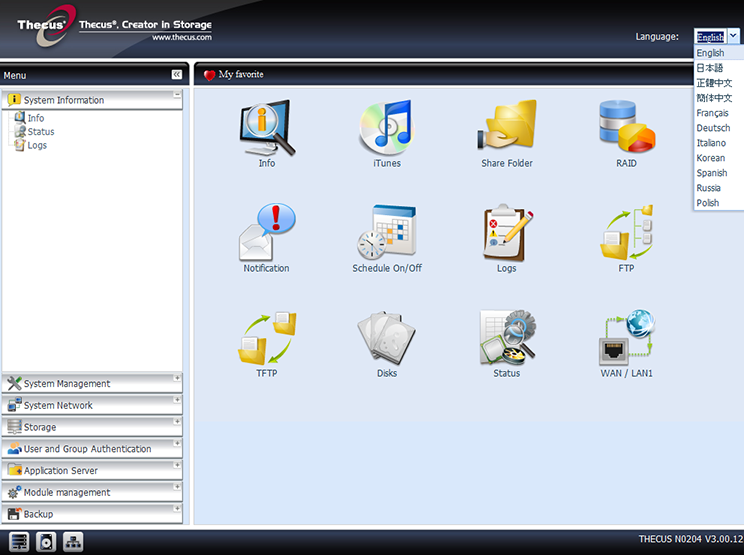 The storage web-interface allows two-way file transfer with the help of built-in eXplorer, whereas the USB Copy button on the front panel makes data backup from the connected USB-drive to internal hard drives. The last mentioned feature can come in handy for transferring photos from a digital camera to the storage when a computer or a notebook is not available. The results of all these diverse tests are presented in the table and the diagram below. Here we’re through with testing and are moving to the conclusions. 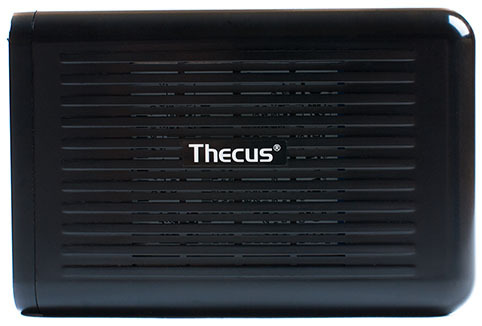 Thecus N0204 is an unusual network storage because of its size and power consumption – it’s the smallest and the most economical we’ve ever seen. Its portability and features make it possible to use N0204 as an access point, a print-server, a surveillance server, a pocket storage for photos and videos and of course as a network data storage. For instance, Thecus N0204 will be handy in a long journey as a universal hard drive to which you can copy the photos of the day without a notebook or a PC. Or it can be used for keeping supplementary materials for a reporter’s presentation or as an access point (with an additional wireless adapter connected) for setting up a temporary wireless network. The support of USB-cameras will come in useful if it’s necessary to record an event. On the whole, we were quite pleased with Thecus N0204 despite rather low data transfer rates. The advantages of the storage are listed below. The support of a substantial number of data transfer protocols including TFTP. Unreliable attachment of the power plug. Unfortunate air flow distribution when the stand is being used. 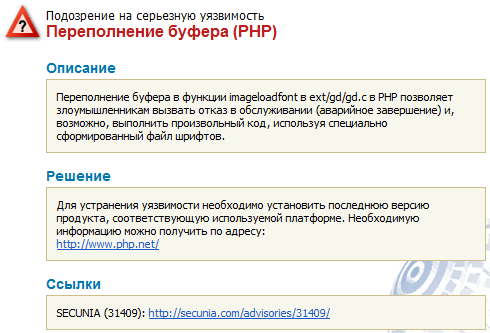 Only partial translation of the web-interface. Low response rate of the web-interface. Lack of a case for transportation. When the article was being written the price for Thecus N0204 (without hard drives) in Moscow internet-shops was 6000 rubles. The author and the editorial staff want to thank the Tayle Company for providing the equipment for testing.